Not only was the 9-year old Martina tremendously delighted when the sleep consultant Daniela Sobietzki surprised her with a complete Wenatex sleep system. Her parents were also so touched with elation over the generous donation that they were practically speechless. 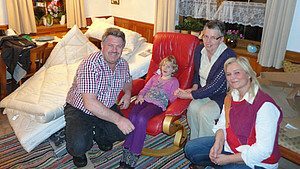 Martina, one of five children within the Wildauer family in Wattens, was born with a spastic paralysis. Her older sister is also severely handicapped. Both of the girls require round the clock care and supervision, which is, of course, both a great physical and financial strain on the parents.Just a few weeks ago, the Wildauer family bought a Wenatex sleep system for the older girl. “Raising the money wasn’t easy for us, and we simply didn’t have enough money to buy a second sleep system.” explained Andrea Wildauer.Without further ado, Wenatex provided the younger of the two girls a complete SilverMed® Deluxe Sleep System, consisting of an electrically adjustable bed insert, mattress, pillow and duvet. The Wenatex sleep system should not only help little Martina to find a more restful form of sleep, but also considerably improve the situation for her mother Andrea by alleviating the everyday strain of her nursing tasks.Wenatex has been involved in numerous social activities for many years. This is because the Salzburg business has always shown a great interest and commitment toward helping those who are disadvantaged, such as little Martina.